Problems with simple Data Bases. 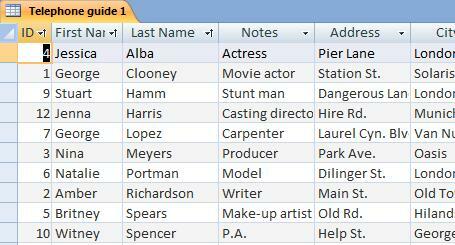 Simple Data Bases are those formed by a single Table with data. This type of Data Bases is easy to create and use and the cover the majority of the necessities of many people. For example, to create and manage a telephone guide (course 1 of Access), we simply need basic Access knowledge. However, if we are working for an enterprise, we will need, for example, to keep the records of our "Clients", "Suppliers", or any other aspect we might find necessary. We might also want to keep a record of the "Products" we have sold or bought; aspects usually reflected in a warehouse control. It goes without saying that anyone who has used an Access Table knows that managing all of these points in a single table can become a hard task; mainly due to its magnitude. Imagine all the fields we would need to carry out an extensive control of the items in stock, the income, the expenses, what we bring in or we take out of the warehouse....we would be using over 20 fields just to do this. Having all this data in a single table would force us to use the scroll bars all the time. Even if we use Reports and Forms to restrict the number of fields we can work on simultaneously, it won't increase the effectiveness since we would have to introduce the same values over and over again in our Table. It might seem to you that it is not too much work to introduce the information of a client every time we make a sale. It is logical for us to want to know to whom we have sold a specific item/product/service. It is also a good idea for us to keep their telephone number to follow-up on their satisfaction in regards to our "Products" and services. We should also have their Address, their ZIP code, and other accounting data, such as their form of payment and internal credit score. I'm sure you can think of countless aspect you could include in this list that would be vital to your business. Imagine what it would be like to introduce all this data whenever we make a sale. The advantages of having a Complete Data Base might overcome the inconveniences we might face if we were to introduce all of this data on each sale. Let's be realistic; we usually sale to the same "Clients". We usually have a dossier of "Clients" which doesn't usually change and consume the majority of our "Products". This implies that to keep our Data Base up-to-date, we would have to introduce the same data over and over again every time one of these common clients makes a purchase. Ask yourself, how many transactions does your better client make? In the case of our "Suppliers", it is the same issue. Does it make sense for us to introduce all the data of one of our suppliers every time we request a product? Of course not. This is equally inefficient. And let's not get into managing this data, such as modifying all the Records of a Client or a Supplier for a simple change of Address. 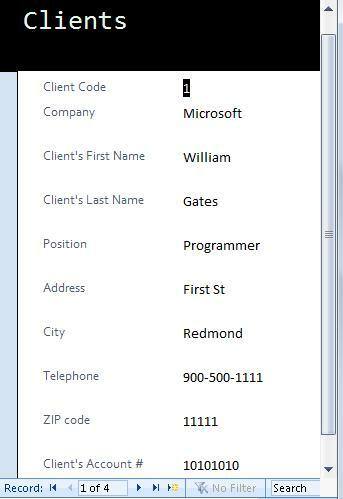 It is not a good idea to have a Data Base in which a Client has two active addresses.